Aldrans based magped GmbH has introduced its magnetic safety pedal at the FSA BIKE Festival Garda Trentino and therefore got welcomed with open arms by the MTB scene. The Austrians announced that the 452 gramme pedals are sold out on the third day of the festival. No wonder as the magped seems to be the ideal alternative for all clipless pedal sceptics. The movable magnet will connect the rider up to a 15kg in attraction force while it still allows a quick release of the foot by a slight move to the side. In addition, a foot rotation for several degrees is still possible while the foot position can also be varied to the front or back according to the terrain you are riding in - without a loss of attraction force. The shoe plate is made of anti corrosion treated steel and is compatible with all SPD bike shoes. It is easy to mount with two screws and is resistant to dirt. 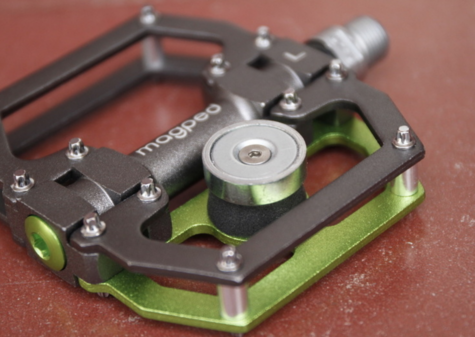 The magped safety pedal costs € 99 and will be available for delivery in two to three weeks again. Check the upcoming BIKE Magazin issue for a first test of the magped.